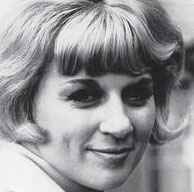 Jackie Trent (born 6 September 1940, Newcastle-under-Lyme, Staffordshire, England - died 21 March 2015, Minorca, Spain) was a British singer, songwriter and actress. She was married to Tony Hatch from 1966 until their divorce in 2002. Jackie wrote over 400 songs, many in collaboration with Hatch. In 1965, she had a number one hit performing 'Where Are You Now My Love' which they wrote. As a team, they went on to write many hits for numerous artists including Petula Clark and Scott Walker. They also wrote theme songs for TV shows including Mr & Mrs, The Morecambe & Wise Show and for the Australian TV series Neighbours. Together with Hatch, they started their own music publishing company M & M Music. In 2005, she married Colin Gregory.